Greveco Client in Oxnard California: Nyne Multimedia, Inc.
GreveCo. Displays and Exhibits is one of the most reliable manufacturers of quality trade show booths and point of purchase displays. Their products are robust, and their services are efficient, and these are all at competitive prices. One of their most successful projects is with Nyne, a multimedia company based in Oxnard, California that manufactures Bluetooth speakers, alarm clocks, tabletop radios and stereos. Their products are known to have compact designs, with high quality sound. 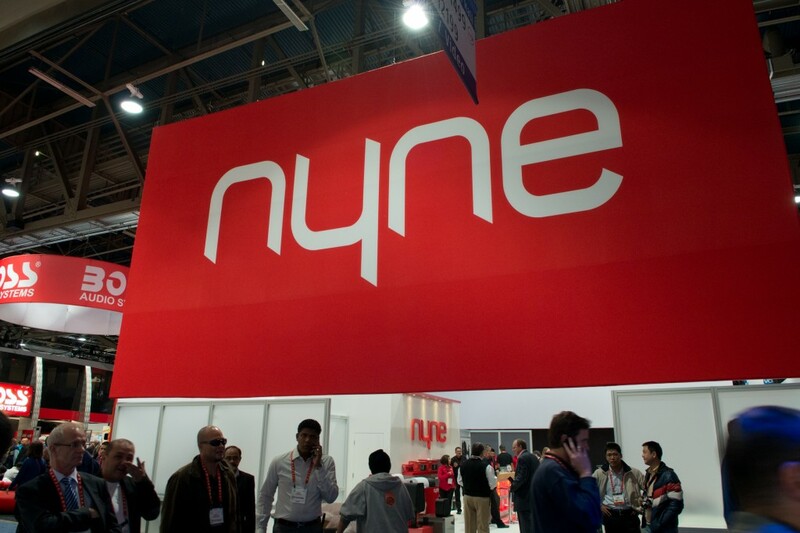 In January 2014, Nyne participated in a huge trade show convention in Las Vegas, Nevada – Consumer Electronic Show (CES). This was one of the largest trade show events in Las Vegas. The show utilized all of the 3 big halls that make up the Las Vegas Convention Center. Greveco helped Nyne come up with an effective design for their trade show booth, and built it for them. 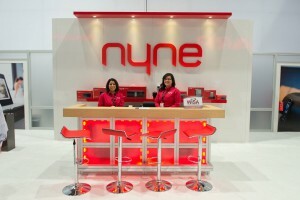 Nyne’s trade show booth was set up in the central hall, where all the home product companies were assigned to display. Samsung and Sony were among the many home products that had trade show stands in that hall. 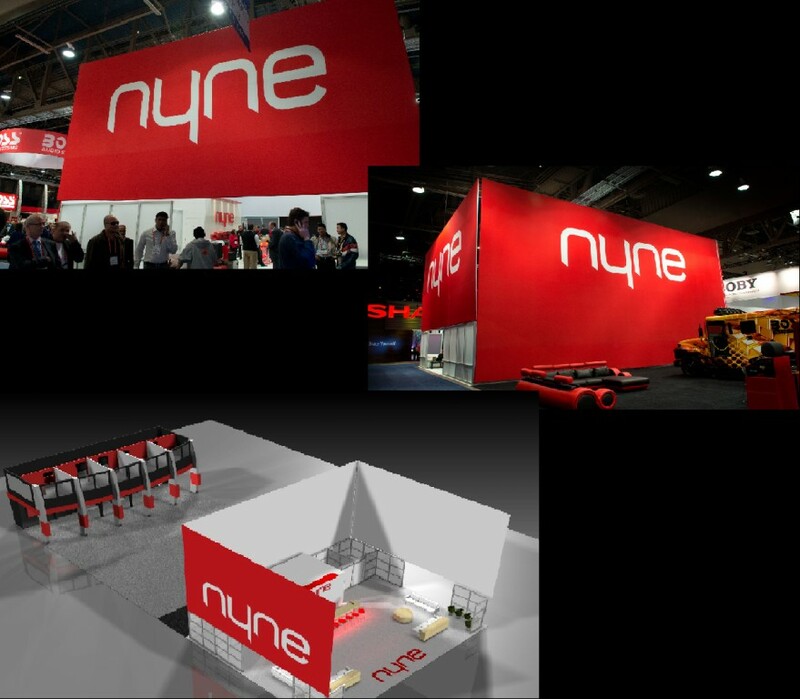 Nyne’s trade show booth had to have a large presence in that hall, in order to be seen from far away, and so that they could compete with the other companies that were participating. The booth constructed was 40 feet deep and 50 feet wide, and had 30-feet tall banners go around its perimeter. The banners were set up at about 8 feet from the ground, so that trade show attendees could walk underneath them. Passage ways were set up at the sides for attendees to enter. Boss and Nyne are both owned by the same company. The difference is that Boss manufactures stereos for cars, while Nyne manufactures sound systems for homes. Both Boss and Nyne set up their booths in the central hall. In order for Nyne to be consistent with its branding, they wanted have a home environment in one area of their trade show booths. What Greveco did was create zones in 2 corners of the booth, where couches were placed and tables were arranged to recreate a residential ambiance. Stereos were placed on the tables. Another thing that made the Nyne trade show booth stand out was the huge signage that surrounded the booth area. The signage that Greveco produced were approximately 4 feet in height, and most certainly made the booth visible in the huge trade show event. To provide clients with a visual of how their desired trade show booth would look, they designed a 3D booth using a unique rendering software. One of the toughest challenges of being part of a grand trade shows like the CES in Las Vegas is to stand out from a sea of competitors. One of the most effective ways that Nyne stood out in this convention was through the use of pillow case banners. Pillow case banners got their name because the banners go on to a frame like you would put a case on a pillow. The banners are made of printed fabric covers that are slipped up over the top of an aluminum frame, and then zipped up across the top. The frame is made up of aluminum tubing that is fixed together using expansion joints. There were 3 pillow case banners, and each banner was 30 feet tall, which was the maximum height that CES allowed for all trade show banners. It took at least an hour to set up each banner, but even though the banners were magnanimous, they packed down really easily. The quick and efficient disassembling and storing of the banners made the booth design particularly effective. Greveco invests a lot of time, energy, thought and skill into every trade show exhibit, so that all materials could be assembled quickly, without any problem, and then be taken down efficiently later on. Moreover, these trade show materials are designed in such a way that they can be used multiple times. The whole trade show stand is intended not for singly use only. In this way, a company can save a lot because, although the show is something that they need to pay for every year, the exhibits, banners, signage, etc. are paid only once, and reused all over again in the succeeding shows. All the displays in the Nyne trade show booth were easy to assemble, but more importantly, they were easy to tear down. Greveco designed the trade show displays not only to be aesthetically appealing, but also to be easily disassembled. When designing trade show displays, Greveco takes into consideration factors such as the cost of shipping the materials and the space that they’re going to take up in the crate and in the truck. 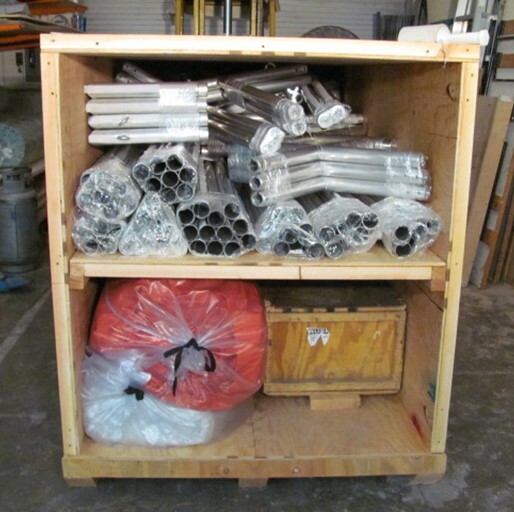 Greveco makes it a point that all trade show materials can be packed as one into the smallest crate possible. Greveco prides itself in creating well-designed trade show exhibits that are simple and straight-forward. 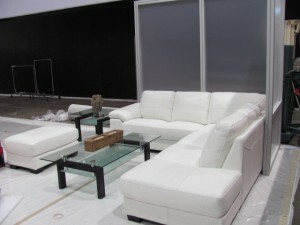 The lifestyle or home environment’s couches were provided by Nyne, but Greveco can source them out if requested by the client. The furniture that Nyne decided to purchase themselves were used for 1 year and then sold to Greveco. These beautiful couches are now part of Greveco’s rental stock, and are available at affordable rental rates. One of the concerns of many businesses when setting up a trade show exhibit is the electrical work. For this Nyne Trade Show Booth in the CES, a lot of the electrical work has been built into the stand. No pre-wiring was done for the small free-standing displays. For the sound room that is enclosed with air conditioning, all of the walls are pre-wired. One can save a lot in the cost of assembling a trade show booth if the electrical work is built into the stand itself. It is important to consider that most trade show events have a regulation wherein an electrician is not needed if the electrical works are already built in as part of the trade show stand. If you won’t need an electrician, you save more in the cost of assembling the booth. One of the noteworthy features of the Nyne display stand is the sound room. Nyne wanted to have a sound room wherein they could take attendees to demonstrate different sound systems in a controlled environment. The sound room is a 10-feet tall, 16-feet wide and 12-feet deep enclosed room complete with a ceiling, ventilation systems, lights and solid core wooden doors. To make the room viable for sound demonstrations, sound deadening fabric was installed on the interior walls. The carpet is an attention-worthy piece in the sound room. The carpet was skillfully engineered by Greveco. Nyne’s logo was cut out from the carpet by printing template letters and cutting the carpet around them. The variety of materials incorporated in this trade show display makes the Nyne project a hybrid type of trade show booth. Each and every part, whether it is the aluminum frames, the frosted acrylic panels, the upholstered walls, or the fabric banners, is manufactured from high quality materials. Greveco has consistently provided customer satisfaction in all of their projects, because they make sure that they use only the best products.